They say people in glass houses shouldn't throw stones, but would it make any difference if the house in question was half-buried in the ground and shaped like a giant blue egg? Well, probably not, but how cool is this pebble-shaped Great Glass House? 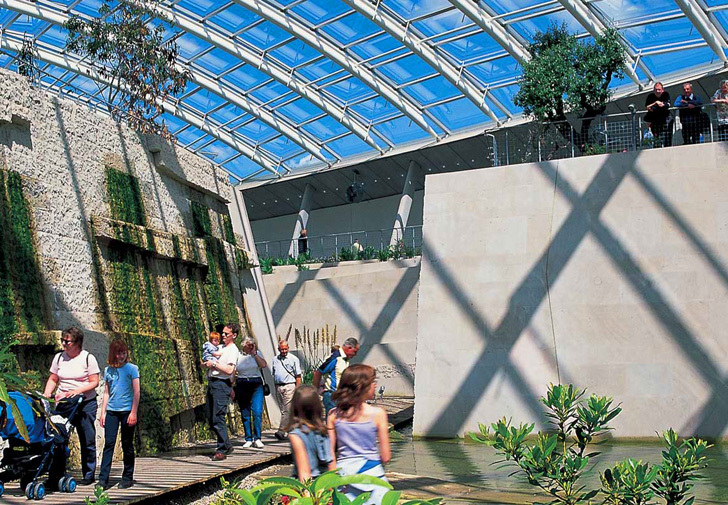 It may seem like something out of a dream but it actually exists and is the largest single-span glasshouse in the world. Located in Carmarthenshire, Great Britain and designed by Foster + Partners, the enormous structure contains more than a thousand plant species (many endangered) and utilizes many sustainable strategies like an energy-optimizing computer-controlled heating system, an aluminum glazing system, rainwater catchment and a biomass boiler. Located in the hills overlooking Tywi Valley, the Glass House is part of the Garden of Wales Botanical Gardens in the UK. 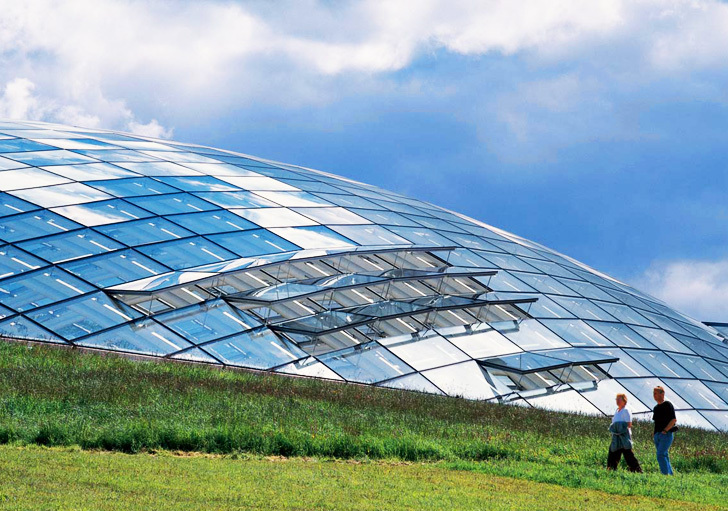 Despite being made of glass, the elliptical building blends into the surrounding grassy landscape quite nicely. Equipped with an aluminium glazing system and tubular-steel supporting structure that minimize materials while maximizing light transmission, the clear roof measures 99 by 55 meters and rests on twenty-four arches. Since the area can be quite cold in the winter, the building’s concrete substructure is banked to the north to provide protection from northerly winds. It’s also partially hidden by a blanket of turf so that three of the entrances appear to be cut discreetly into the hillside. The Glass House has been fitted with an intelligent computer-controlled system that optimizes energy usage by monitoring outside and inside conditions closely. The system can open glazing panels in the roof to achieve the best levels of temperature, humidity and air movement. Most of the heat needed for the greenhouse comes from a biomass boiler which is a lot cleaner compared to fossil fuels. And because the plants that are burnt absorb as much carbon dioxide during their lifetime as they release during combustion, the carbon dioxide cycle is broadly neutral. The Glass House also collects rainwater as grey water for irrigation and toilet flushing. They say people in glass houses shouldn't throw stones, but would it make any difference if the house in question was half-buried in the ground and shaped like a giant blue egg? Well, probably not, but how cool is this pebble-shaped Great Glass House? Located in the hills overlooking Tywi Valley, the Glass House is part of the Garden of Wales Botanical Gardens in the UK. Visitors can enjoy the thousands of Mediterranean plants growing here every time they visit. It's one of the largest free-standing glass structures in the world. Equipped with an aluminium glazing system and tubular-steel supporting structure that minimize materials while maximizing light transmission, the clear roof measures 99 by 55 meters and rests on 24 arches. Sunshine is allowed to seep through the stunning glass panels overhead. The structure is almost reminiscent of the Victorian Crystal Palace and all the wonders it housed. The Glass House has been fitted with an intelligent computer-controlled system that optimizes energy usage by monitoring outside and inside conditions closely. Despite being made of glass, the elliptical building blends into the surrounding grassy landscape quite nicely. The system can open glazing panels in the roof to achieve the best levels of temperature, humidity and air movement. Most of the heat needed for the greenhouse comes from a biomass boiler which is a lot cleaner compared to fossil fuels. And because the plants that are burnt absorb as much carbon dioxide during their lifetime as they release during combustion, the carbon dioxide cycle is broadly neutral. The Glass House also collects rainwater as grey water for irrigation and toilet flushing. It's amazing to think that many of the endangered species housed within may live far longer here than they would in their countries of origin. Since the area can be quite cold in the winter, the building's concrete substructure is banked to the north to provide protection from northerly winds. It's also partially hidden by a blanket of turf so that three of the entrances appear to be cut discreetly into the hillside.